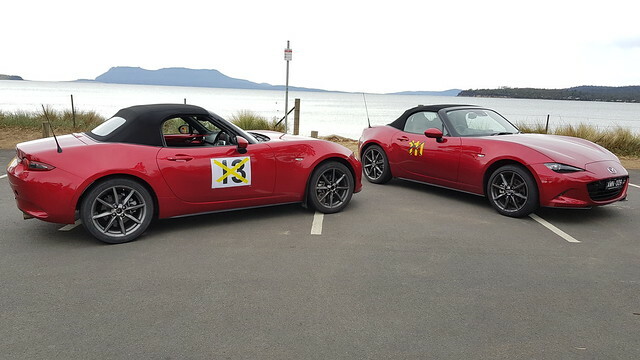 What an opportunity to compare my ND1 up against the ND2 in no better place than the roads and tracks of Tasmania. Where else in the country can you drive around with your track numbers on. Driving along some of the Targa Roads and passes you firstly notice that the ND2 has a deeper exhaust tone and improved throttle response. While driving the ND2 up to 5500rpm there is no difference in the power and torque feel compared with the 2L ND1. Once you get over 5500rpm you notice and feel the 135kW of power working while using the 7500rpm redline. The ND2 feels more planted to the road and is not as nervous as the ND1 probably due to the revised rear subframe bushing and dampers and springs. You can set the ideal driving position because of the tilt and telescope adjustment of the steering column. The left hand cluster display has been revised and displays more info such as dual trip and economy meters, driver alert, lane departure warning, a higher resolution temperature guage and speed sign recognition. Some of the smaller differences are the ND2 has a longer aerial, 17mm wheel nuts vs 21mm wheel nuts, proper TPMS valves fitted and revised sunvisors. The New Crystal Soul Red colour has a deeper red to burgundy pearlescence. 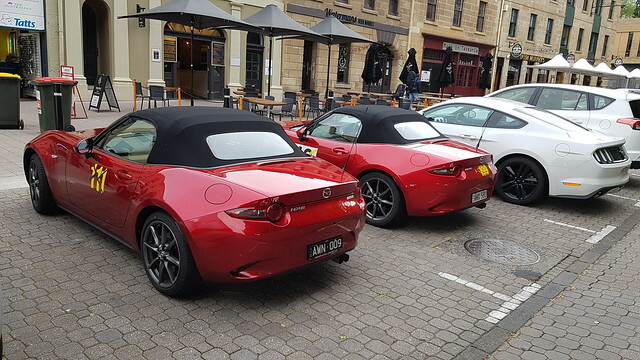 Thank you to Peter Barnwell and Mazda Australia for allowing my son Luke Kovacic and myself the opportunity of driving the new ND2. A damp and wet morning greeted us to the Baskerville Raceway followed by a dry and sunny track for the afternoon. What a track it is! Baskerville has a fast back straight with lots of height and camber changes and an uphill climb taking a blind left hand off camber corner over the hill. This makes the perfect braking and turn in point hard to judge. This track requires a lot more grip so consequently the ND1 with Hankook RS4 tyres, GLoc R6 Brake Pads and a better wheel alignment setup outperform the ND2 with the standard factory setup. The ND2 suffered from brake fade and lack of grip due to the standard factory brake pads and tyres. But due to more power for the ND2, 135kW vs 118kW it obtained a higher speed down the back straight of 173km/h vs 164km/h. Thanks to my son Luke Kovacic and his driver abilities he was able to manage a laptime of 1:04.12 in our ND1 vs a laptime of 1:05.49 in the ND2. 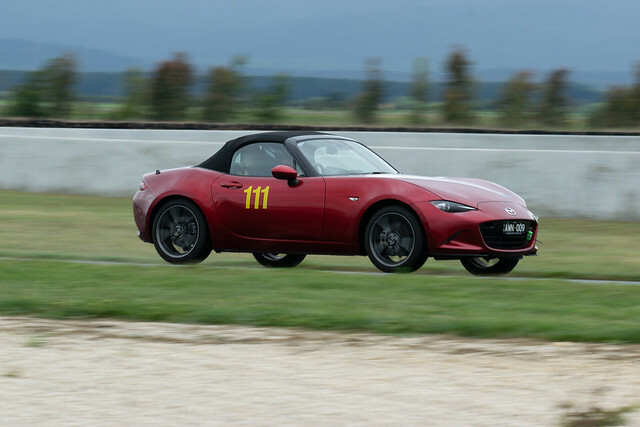 I am pretty sure that if the ND2 had the same setup as our ND1 with better tyres, brake pads and wheel alignment setup it would be probably be about one second faster around this track. As fate would have it, a damp and wet morning greeted us at Symmons Plains Raceway followed by a dry and sunny track for the afternoon. This track is all about power rather than grip, so consequently the ND2 had the ND1 covered for outright speed and laptimes around this circuit. In the ND2, Luke managed a top speed of 179km/h down the back straight with a lap time of 1:08.54 vs the ND1 top speed of 174km/h and lap time of 1:09.10. Because Luke was driving the pants of the ND2 he completely destroyed the standard front brake pads and went off at the hairpin and into the gravel. Once again, if the ND2 had the same setup as our ND1 with better tyres, brake pads and wheel alignment setup, it would be probably be about one second faster around this track as well. 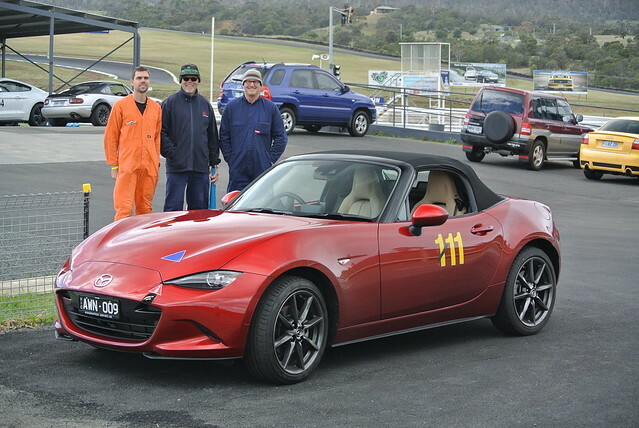 Thanks to Randy and Gavin from the MX-5 Club of Victoria & Tasmania for inviting us to these two special trackdays. Keep your eyes open for a future Interstate Club Challenge at these two tracks.